Determining the world's largest cities depends on which definitions of city are used, as well as the criteria used for size: this article focusses on population. The United Nations uses three definitions for what constitutes a city, as not all cities may be classified using the same criteria. Cities may be defined as the cities proper, the extent of their urban area, or their metropolitan regions. A city can be defined by its administrative boundaries (city proper). World Urbanization Prospects, a UN publication, defines population of a city proper as "the population living within the administrative boundaries of a city or controlled directly from the city by a single authority." UNICEF defines city proper as "the population living within the administrative boundaries of a city or controlled directly from the city by a single authority". A city proper is a locality defined according to legal or political boundaries and an administratively recognised urban status that is usually characterised by some form of local government. 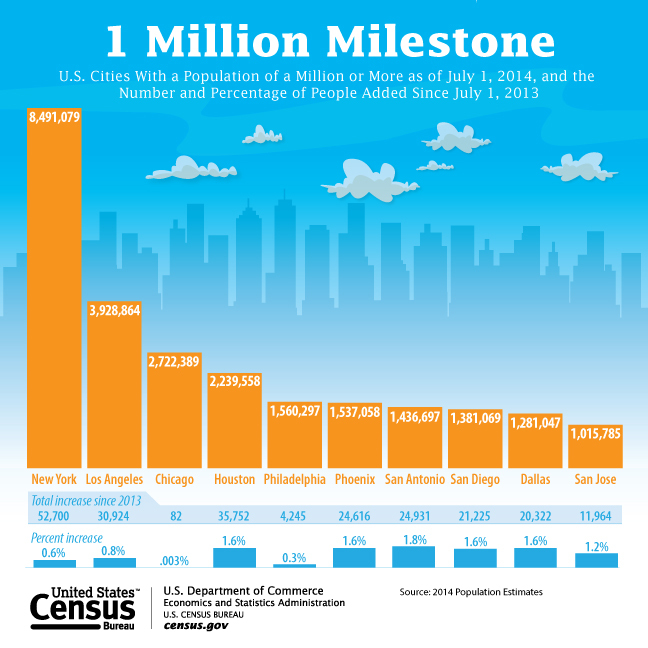 Cities proper and their boundaries and population data may not include suburbs. The use of city proper as defined by administrative boundaries may not include suburban areas where an important proportion of the population working or studying in the city lives. Because of this definition, the city proper population figure may differ greatly with the urban area population figure, as many cities are amalgamations of smaller cities (Australia), and conversely, many Chinese cities govern territories that extend well beyond the traditional "city proper" into suburban and rural areas. ^ Sum of the 2014 population estimates for the "urban-function core district" and "urban-function extended district" of Chongqing, which were 3,677,600 and 4,512,200 respectively. See also the next note. ^ Shanghai, Hangzhou, Nanjing, Suzhou, Wuxi, Ningbo, Changzhou, Shaoxing, and urban area of Zhangjiaggang-Jiangyin within the prefecture-level cities of Suzhou and Wuxi are treated as separate urban areas which constitute the Yangtze River Delta economic zone. Huai'an (1,856,000; 148 km2), Xuzhou (1,246,000; 233 km2), Nantong (1,036,000; 233 km2), Lianyungang (985,000; 155 km2), Zhenjiang (983,000; 168 km2), Yancheng (797,000; 207 km2), Huzhou (690,000; 111 km2), Taizhou (in Jiangsu Province; 300,000; 117 km2) and Suqian (220,000; 36 km2), as well as urban areas of Yangzhou (1,593,000; 233 km2) and Gaoyou (180,000; 39 km2) within the prefecture-level city of Yangzhou, urban areas of Kunshan (1,596,000; 492 km2), Changshu (1,139,000; 285 km2) and Taicang (523,000; 117 km2) within the prefecture-level city of Suzhou, urban areas of Cixi (1,200,000; 298 km2) and Yuyao (650,000; 122 km2) within the sub-provincial city of Ningbo, urban areas of Jiaxing (1,044,000; 259 km2) and Tongxiang (510,000; 52 km2) within the prefecture-level city of Jiaxing, urban areas of Wenling (510,000; 52 km2), Jiaojiang (375,000; 41 km2) and Huangyan (200,000; 34 km2) within the prefecture-level city of Taizhou (in Zhejiang Province), urban areas of Zhuji (500,000; 117 km2) and Shangyu (400,000; 158 km2) within the prefecture-level city of Shaoxing, urban areas of Yiwu-Dongyang (925,000; 233 km2), Jinhua (520,000; 186 km2), Yongkang (500,000; 223 km2), Dongyang (260,000; 104 km2) and Lanxi (220,000; 34 km2) within the prefecture-level city of Jinhua, and urban area of Fuyang (450,000; 49 km2) within the sub-provincial city of Hangzhou are also excluded. ^ Lagos consists 16 out of Lagos State's 20 LGA, which excludes: Badagry, Epe, Ibeju-Lekki and Ikorodu. ^ Preliminary and disputed by all the major political parties in Sindh. ^ a b c d e f g 中国2010年人口普查分县资料. Compiled by 国务院人口普查办公室 [Department of Population Census of the State Council], 国家统计局人口和社会科技统计司编 [Department of Population and Social Science and Statistics, National Bureau of Statistics]. Beijing: 中国统计出版社 [China Statistics Print]. 2012. ISBN 978-7-5037-6659-6. ^ "Archived copy". Archived from the original on 8 September 2014. Retrieved 8 September 2014. CS1 maint: Archived copy as title (link). Retrieved 2 July 2014.